Came across this picture of young pianist Johnson Zhongxin Li and it just melts my heart. It is so rare to see kids these days without their smartphones and tablets. Even rarer to see them getting back to basics and writing with a proper instrument. The child prodigy performed at the The Lang Lang International Music Foundation Inaugural Gala at Carnegie Hall in New York earlier this week. Lang Lang, one of the most amazing pianists of our generation, hosted the concert to benefit the charitable foundation, in which Montblanc is a patron of. The foundation aims to develop sustainable activities for children to inspire them to cultivate their passion for music. It is really nice to see Lang Lang doing that and supporting the next generation. 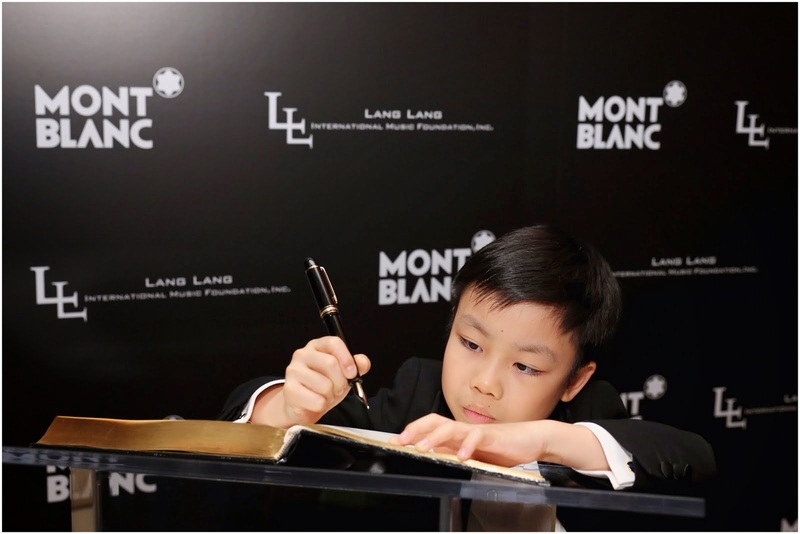 And I really love the picture of young Li signing in with a classic fountain pen. It kind of got me thinking, that I should buy less dresses for that little darling of my friends, perhaps a classic pen when she starts school proper as a little encouragement. My style idol Johannes Huebl was at the event, looking gorgeous as usual. Lang Lang, Johnson Zhongxin Li and Danish pop diva Oh Land. Why have I not heard of Oh Land? She is utterly gorgeous! Here is my trusty notebook and pen which I carry everywhere with me, honest. (Since no one is asking me to do one of those 'what's in your bag' features, I have to do one myself). The maroon coloured ball point pen from Montblanc actually belonged to my father. I would love to say he handed it down to me, but I probably pilfered it years ago when he wasn't looking. I am a sentimental person, hence I carry it everywhere with me, and actually use it when I can though most things are iPadded or iPhoned these days. And it got me thinking that perhaps I should get him another pen for Father's Day, seeing that I nicked his years before. Shopping this weekend it is then. I actually bought the same last weekend but in a different colour. Really nice. Are you on twitter instagram or Facebook with your blog?